(June 8th, Guangzhou, China) EHang and Yonghui announced their new collaboration in smart retailing and aerial drone food delivery. It is going to be tested in Super Species, Yonghui’s fresh foods store, located in M+ Park in Guangzhou, China. The delivery route to peripheral neighborhoods is also the first normalized aerial drone delivery airline in China. From May 18th to June, EHang’s logistics drones have conducted over 600 trail flights on this airline without any failure. With the help of drones, the delivery time is reduced from at least 30 minutes to about 15 minutes, which ensures freshness and efficiency. Guests attending the opening ceremony include Yuhui Zheng, CEO of Superstores Guangdong; Derrick Xiong, Co-Founder of EHang; Qingxian Liu, Chief Manager of M+ Parks; Kexin Wang, director of Wechat Open Platform; and Ding Wei, the business manager of Huawei Digital Sky Initiative. According to Yuhui Zheng, Super Species has been trying to combine innovative technology and retailing such as scan to pay, face ID purchases, and today’s drone delivery. Super Species focuses on using different retail scenarios to solve the most urgent problems. Its innovative attempt to transport food by drones will provide valuable experiences for future Smart Deliveries. 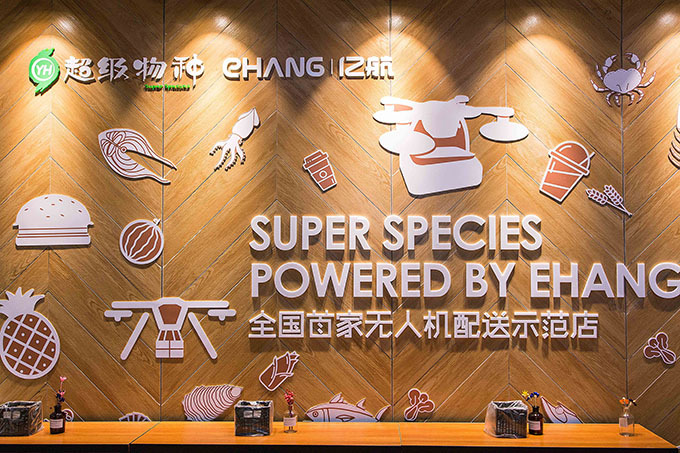 EHang’s Co-Founder Derrick stated that, the company’s automatic, intelligent and networked drone technology provided an integrated drone delivery solution for Super Species. In an age with increasing labor costs and rapid-growing smart delivery, EHANG is poised to empower companies across the industries of delivery, retail, e-commerce, etc. with the capacity of smart drone delivery for a saft, open, smart and efficient air delivery platform. Guangzhou is a city with profound food culture, and it is part of the reason why Super Species has picked here to be the first stop of trail collaboration. The 600-square-meter store at M+ Parks serves fresh lobsters, salmon, beef, fruits, liquor and other foods. Until now, Super Species has launched 44 chain stores across the country, and has aimed to develop a “service circle” with radius of 3 km at every store. 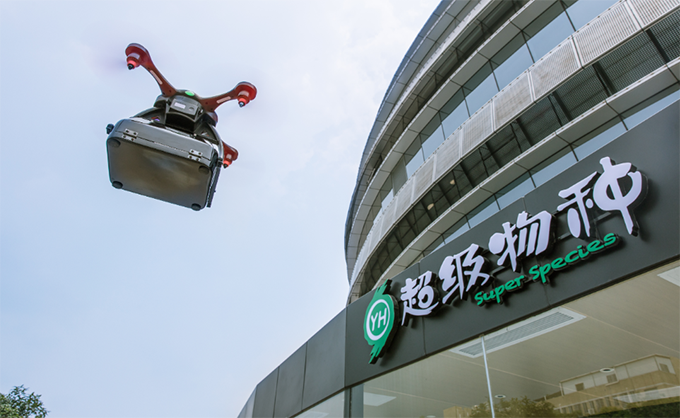 Here goes the process of Super Species’ drone delivery service: at first, customers who locate near the store need to make an order through Yonghui’s mobile application, and then the system will automatically decide whether the order will be delivered by couriers or drones. When the staff put the product into the food box under the drone and click the “take-off” button, it will set out to targeted neighborhood along predetermined airways. Before the drone lands, the community courier at targeted neighborhood will receive a notice and head towards the landing point for picking up the food and sending back the drone through a fixed airline by a simple click. Then the courier will finish the delivery within last 100 meters to the consumer’s door. Freshness and efficiency are essential in foods delivery. Under an urban setting, drone is able to deliver from one point straight to the other. It avoids couriers’ delays like red lights and heavy traffic. After calculation, drone saves up to 40% - 60% of delivery time, and when airlines are expanded enough to create a large-scaled aerial logistics web, delivery cost is expected to be lowered by 50%. The EHang quadrotor delivery drones can fly at the speed of 40 km/h. Each can carry the weight of 500g and fly within a 4.5 km radius. In the future, EHang will launch larger delivery drones that can carry 5kg and travel 7 km to transport more types of goods and serve more consumers. The trail run of drone delivery is based on Super Species’ app “Yonghui Life”. The perfect synchronization between EHang’s drone delivery control system and Yonghui’s platform enables every order to be trackable and data to be shared promptly between customers, stores, delivery drones and supervisors. 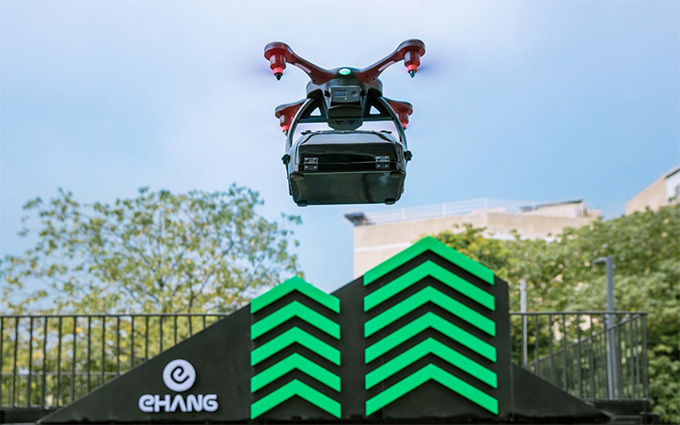 As the world’s leading UAV company, EHang has showed its strength in connected drone technology, intelligent systems and data processing. In addition, the project will not be successful without Huawei’s telecom support in flight route planning, data transmission and remote control of the delivery drones. In the future to come, EHang will join hands with more partners to create better drone delivery services and experiences. 2 A bird?A plane?No, it's a pilotless flying taxi!